Habit: Perennial herb, prostrate (non-flowering stems) or ascending to erect to mat-forming, taprooted. Leaf: needle-like to narrowly linear; vein 1. Inflorescence: terminal, open to head- or umbel-like; flowers 1--many; peduncles, pedicels 0--55 mm. Flower: hypanthium present; sepals 5, +- free, 3--7.2 mm, lance-linear to ovate, glabrous to glandular-hairy; petals 5, 2--18 mm, entire or +- notched; stamens on hypanthium; ovary +- superior, styles 3, 2.5--3 mm. Fruit: capsule, ovoid to urn-shaped; teeth 6, ascending to recurved. Seed: 1--9, +- gray, dark brown, red-brown, yellow-tan, black-purple, or +- black. Species In Genus: 90 species: northern temperate, especially western North America, Eurasia. Etymology: (Greek: solitary or deserted + seed, allusion uncertain) Note: Based in part on molecular evidence (Harbaugh et al. 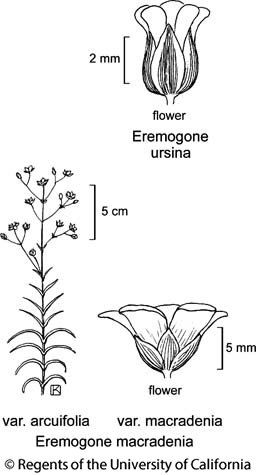 2010 Intl J Plant Sci 171:185--198), 2 subgenera of Arenaria treated here as Eremogone. Habit: Perennial herb, tufted, green. Stem: 20--40 cm, rounded, +- dull, glandular-hairy or not. Leaf: 20--60 mm, 0.5--2 mm wide, blunt to sharp-pointed, vein 1. Inflorescence: terminal, generally open; flowers several to many; pedicels 3--55 mm. Flower: sepals 4.5--7.2 mm, in fruit < 8 mm, acute to acuminate; petals 6--11 mm; nectaries rectangular, 2-lobed or truncate, 0.7--1.5 mm. Fruit: 6--7 mm. Seed: 4--9, 1.8--2.7 mm, +- spheric to ovate, compressed, red-brown to +- black; tubercles low, rounded to conic. Leaf: +- ascending, 0.8--1.2 mm wide. Inflorescence: branches (and sepals) +- glabrous. Flower: sepals 4.5--7.2 mm, in fruit < 8 mm. Synonyms: Arenaria macradenia S. Watson var. macradenia; Arenaria macradenia var. parishiorum B.L. Rob. Citation for this treatment: Ronald L. Hartman & Richard K. Rabeler 2012, Eremogone macradenia var. macradenia, in Jepson Flora Project (eds.) Jepson eFlora, http://ucjeps.berkeley.edu/eflora/eflora_display.php?tid=81557, accessed on April 24, 2019.
s SN, SnGb, SnBr, SNE, DMoj; Markers link to CCH specimen records. Yellow markers indicate records that may provide evidence for eFlora range revision or may have georeferencing or identification issues. Purple markers indicate specimens collected from a garden, greenhouse, or other non-wild location.